I spent years brushing my teeth with a manual toothbrush and never thought anything of it! It’s just what we all did before technology improved to the point where electric toothbrushes were invented. 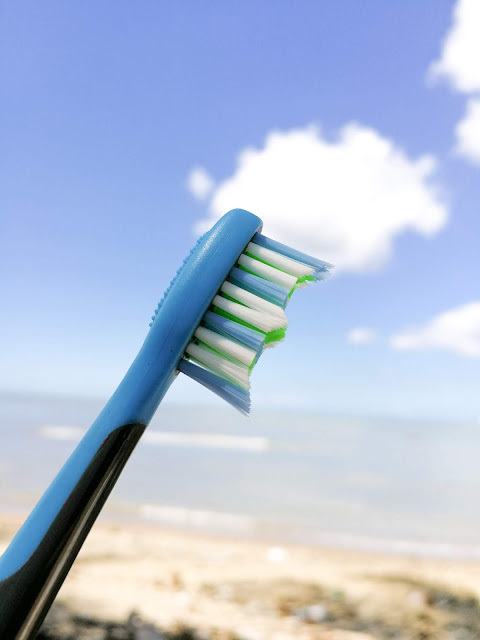 While many people embraced that new technology, I chose to stick with what I knew…which was the manual toothbrush that I replaced every few months for a couple bucks each time. 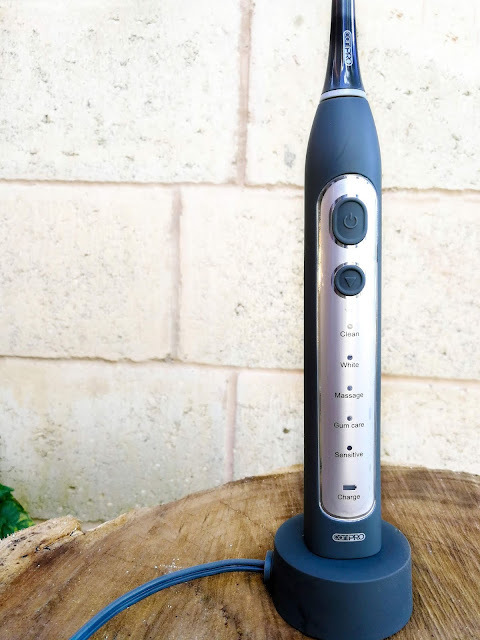 It wasn’t until recently that I decided to give in and try the CariPRO Ultrasonic Toothbrush and let me tell you, MY MIND WAS BLOWN! I couldn’t believe how much better my teeth felt after just that first brushing! And, it was so simple to use too! First, let me tell you that the CariPRO Ultrasonic Toothbrush is this new amazing electric toothbrush from Smile Brilliant. The company began as a family-owned business who wanted their customers to see how easy it was to have professional quality teeth whitening right in the comfort of their own home. Nowadays, this company has grown to a well-known brand that offers numerous products to help people keep their teeth looking fabulous every day. Now, I know I said that this toothbrush is easy to use, but to be honest, I was a little overwhelmed when I first received it! There were so many settings, and I had no idea which one would be my best option! The clean setting is the standard mode and it allows you to get a superior daily cleaning for your teeth. The white setting is the most powerful cleaning mode and I use it when I want a vigorous deep cleaning or need to remove some surface stains. I have found that the massage setting is excellent for gum stimulation, but it is kind of time-consuming, as you will need to use this in addition to another setting to get your teeth clean. The gum care setting needs to be used with another mode setting as well, which will add time to your brushing. However, this setting is great for gentle cleaning along the gum line. The sensitive setting can be helpful to those who find that the clean setting is a little too aggressive for their teeth. This setting will not cause pain or bleeding for those with sensitive gums and teeth. Each one of the five settings takes two minutes to complete and I love how there is a brief pause every thirty seconds. I use that brief pause to alert me to switch to a new section of my mouth! This ensures that I spend the same amount of time on each section of my mouth, instead of rushing through at the end. I have personally used all the settings and have found that both the clean and sensitive settings are my absolute favorites! I normally use the whitening setting once a week so I can keep up with any new staining on my teeth. However, I will also use that setting after having any harsh food or drink item that causes staining, because it is so easy to do. This way I never need to worry about having stains on my teeth in between my normal routine. One of the things that I was worried about with an electric toothbrush like the CariPRO Ultrasonic Toothbrush was the battery life. I am not the type of person who wants to charge their toothbrush every other day, nor did I want to start to brush my teeth with it to only find the battery dying halfway through. Well, I have never needed to deal with any of those issues, because the battery life on this electric toothbrush is phenomenal! I normally plug it in on the same day every two weeks and it lasts until the reminder pops up on my calendar again. I could probably go longer in between charges, but I don’t like to push my luck too much! 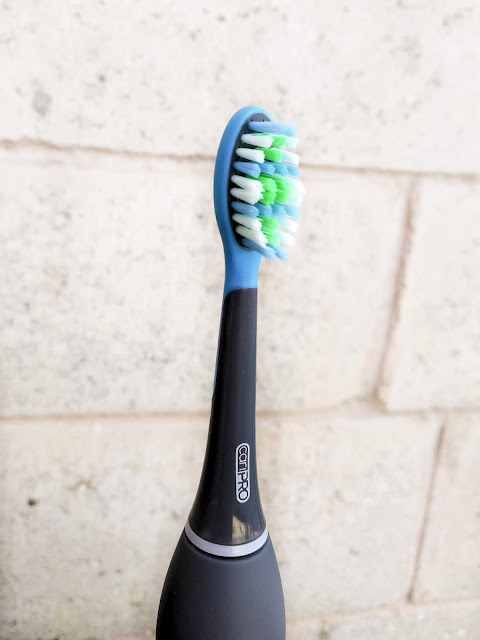 My favorite part about the CariPRO Ultrasonic Toothbrush is that I can easily use it at the end of a long day of being a mom! I am so busy from the time I wake up in the morning until the time that I go to bed at night, which means I barely have the energy to walk to the bathroom, let alone brush my teeth! Now that I have my CariPRO Ultrasonic Toothbrush, I don’t mind the extra two minutes it takes, and it helps me relax and unwind, as I hear the whirling sound of the brush on my teeth. If you have been skeptical about the new electric toothbrushes, give in already and purchase the CariPRO Ultrasonic Toothbrush! Your teeth will thank you and so will you at the end of yet another long day! I am also giving away one of these amazing toothbrushes for FREE!!! Just click the Giveaway Link and sign up! : CariPRO Ultrasonic Toothbrush GIVEAWAY! This looks and sounds great. I am so much more concerned with my dental care now than I used to be. So important to have this caripro ultrasonic toothbrush. I still have a manual brush but my husband swears by his electric one. I must say the Caripro really does look a cut above the rest. I always wanted to get an electric toothbrush and not sure which one to get. After reading your review of CariPRO Ultrasonic Toothbrush, I feel like having one. Glad that I dont have to change the battery every now and then. That looks like a great toothbrush. I love the idea of an ultrasonic toothbrush because the vibrations can really get in there and break up plaque. It is interesting that this toothbrush has a sensitive setting. I have tried electric toothbrushes in the past but they were all very harsh and brushing with them my sensitive teeth always ended up in pain. 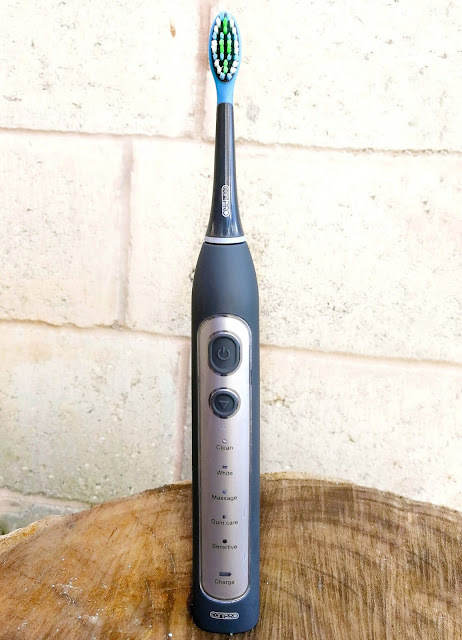 Thank you for the review - I have been considering getting an electric toothbrush for sometime, and I’ve made up my mind which one I will try :) thanks! This toothbrush sounds like just what I need! I love the gum care option! Will definitely try this out. This toothbrush sounds like a great basic. I've heard that electric toothbrushes do a better job cleaning your teeth. I used one for awhile and liked it. Thanks for the tips. I've not used a manual toothbrush for over 10 years, and it makes a big difference. This one looks great too! This looks like a great toothbrush! I like that it has a setting for more sensitive teeth. Yes, I am in the same club of never going manual again as well. Nice post/review of CariPRO Ultrasonic Toothbrush. I have to check out them out! I use an electric tooth brush too and it works so well. Great review. I would love to hear your thoughts, please leave a comment. Thank you!